As September rolls into October the people of Puerto Rico still continue to deal with the devastation from Hurricane Maria. Only five percent of the population has power, 55 percent of the people don’t have drinking water and CNN reports that schools may not be able to reopen for weeks. Meanwhile the political tomfoolery of the Trump administration’s response to this American territory continues to be a disappointment of basic humanity. These stresses are felt by many Americans on the mainland who have emotional and familial connections to Puerto Rico, including HBCU athletes. Randal Ortiz is a senior baseball player at Winston-Salem State University. His mother currently lives in the United States but he has three brothers and one sister back home in Puerto Rico. He’s spoken to his older brother on the phone only to find out one of his other brother’s home was completely destroyed. That brother has a two year old son and a two month old daughter. He’s desperate because he hasn’t been able to find food to feed his youngest child. Ortiz, who is a dad himself, can only agonize from his current home in Winston-Salem. “It’s hard, it breaks my heart because I have a two-year old daughter and I feel his pain. I feel what he’s going through. Whenever my brother told me that, I felt that like it was my daughter. My daughter not having any meal or food or anything like that. I feel their pain. It breaks my heart they are going through all that, not even my family, all of Puerto Rico is going through that,” Ortiz said at a recent press conference on campus. His older brother’s home is still in good shape relatively speaking, but the terrain is scattered with trees which makes getting there for the rest of the family very difficult. Other HBCU athletes with family members in Puerto Rico are trying to do what they can to help while they are still on the mainland. Alexa Rodriguez and Heizel Quinones are on the bowling team at Norfolk State University and they took the initiative to do what they could from Virginia. Quinones, who is from Toa Baja, came up with an idea to collect essential goods at athletic events and the Student-Athlete Advisory Committee kicked off the running donation drive this past Friday with plans of it running throughout the remainder of the fall. Rodriguez couldn’t contact her family for two days before a friend with cellular service finally got them together. She is now able to communicate with her sister through email but it was an ordeal not knowing what was going on initially. “I knew my family was going to be safe because we live in a good house, but you don’t feel that security until you can hear from them,” Rodriguez said. Athletes at other campuses are actively involved in donation drives as well to support Puerto Rico. The Alabama State baseball team currently has six players from Puerto Rico according to coach Jose Vazquez. The baseball and softball teams have joined together for a donation drive that starts this week at all athletic events on campus. “All of them still have family on the island and are affected by the hurricane. This initiative is near and dear to our team, and we really hope that our Alabama State University family and the community will support us as we work to send items to Puerto Rico,” Vazquez said. While the donations are absolutely necessary and a great sign of support, these student athletes still have to maintain their commitment to academics and sports while their loved ones struggle to survive. 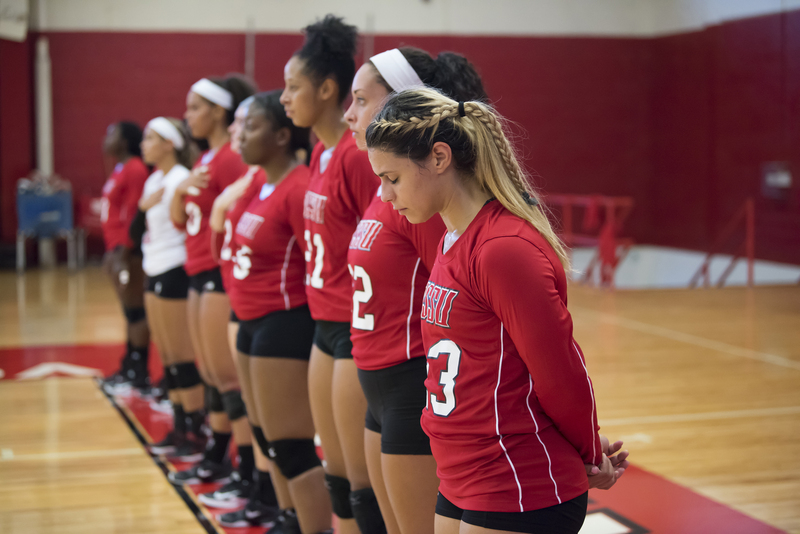 Michelle Murray-Garcia is a senior volleyball player at WSSU and her team is currently enjoying a ten match winning streak. Her mind is never far from her home in Puerto Rico, however, and the once daily conversations she had with her mother. For all the unnecessary political grandstanding that has gotten involved in the relief efforts, Murray-Garcia has one simple message. Puerto Rico is a part of America too. “For Texas and Florida they’ve done stuff, so just look at us the same way, even the Virgin Islands. We’re basically a part of yall,” she said. “It’s just hard to know that some people might not understand it or see it like that. They just see it as a vacation but to me it’s my home and I can’t go home right now. I wish I could and I wish everyone else understood it.